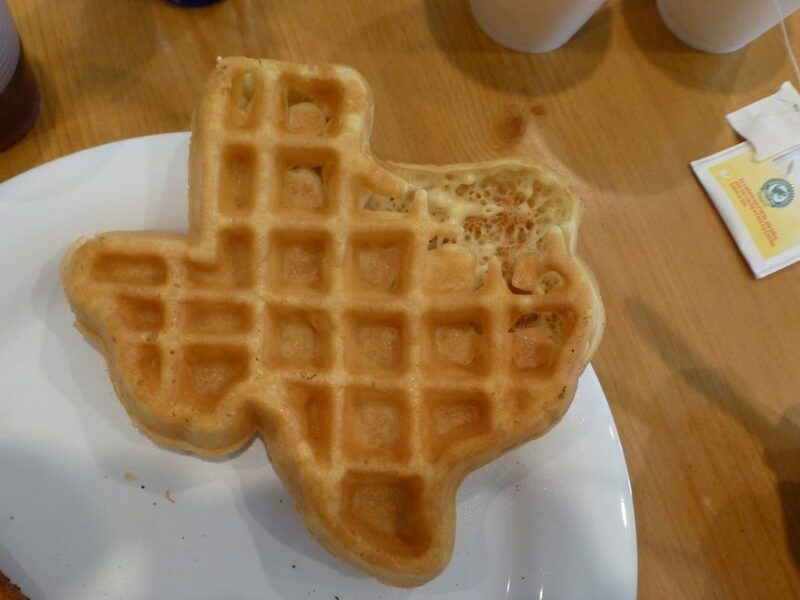 As a child, I would have loved to eat Texas shaped waffles every day. Breakfast was always a rushed affair, with my parents attempting to manage me, my siblings, and their own needs in a tight timeframe with far too many tasks to attend to. In our chaotic household, we usually only had time for cereal or something heated up in the toaster. Waffles were a thing of luxury. Now, I can’t help but wonder how much of that was a result of poor planning and poorer equipment. A Texas shaped waffle maker can bang out flawless, crispy novelty waffles in a matter of minutes. If I had woken up a few minutes earlier, made a bowl of dough, and heated up the iron, I could have enjoyed a golden treat in the shape of the Union’s most obstinate state every morning. Just because I’m an adult now doesn’t mean that I have no love for fluffy lone-star waffles. The Texas shaped waffle maker is a surprisingly solid tool that holds its own against contemporary normal waffle makers. The inclusion of novelty plates in no way interferes with its functionality, making it a solid choice for any household that wants to liven up breakfast. This electric waffle maker combines two sets of heating components with durable, non-stick plates. 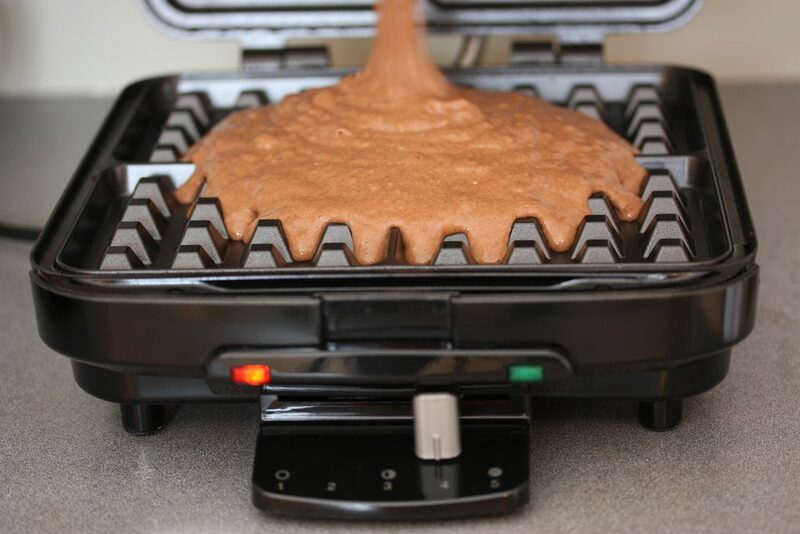 While the waffle maker is plugged in, the coils rapidly heat up the plates and cook the waffle from both sides. A simple red light pops off when the waffle reaches a certain level of doneness. So how does this waffle maker compare? Let’s run down a list of key criteria and evaluate how it stacks up with popular models from other brands that make more “normal” shaped waffles. First, let’s talk about setup. This simple waffle maker doesn’t have any fancy features. This means that the process of taking it out of the box and preparing it for use is quite simple. The plates in this waffle iron are made with a durable coating that requires a bit of seasoning before use. This means you’ll want to go through a pretty basic process that involves heating up a bit of oil or butter in the iron before you cook a waffle “for real.” The normal procedure is to make some waffle batter, put a LOT of oil or butter on the iron, and then pour a little bit of dough in to fill up space. You’ll cook the batter like normal and then throw it out. This process is critical to ensuring that your Texas waffles don’t stick. It’s a fairly fast process that should take less than ten minutes from start to finish. Okay, so you’ve got the waffle maker set up. How well does it cook waffles? The answer might actually surprise you: the waffles that come out of this machine are incredible. There are no gimmicks here, just honest, robust construction. The device works. With no buttons, levers, or twist handles, it’s difficult to screw up your waffles. This means that you’ll be able to enjoy a wonderful breakfast, even if you’re not normally an expert cook. The simple design of this tool leaves a surprising amount of room for creativity and user preference. When the machine thinks your waffle isn’t done, a red light turns on. When the machine thinks your waffle is done, the red light turns off. That’s it! Since this red light has nothing to do with the operation of the machine or how hot the plates are, you can cook your waffles for as long or as little as you like. 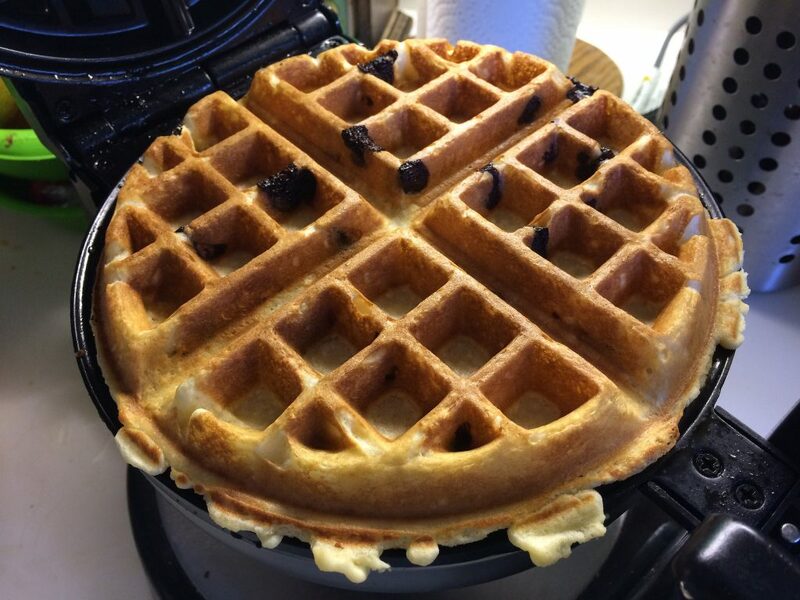 Users suggest that leaving waffles in for about a minute after the light flashes off makes them nice and crisply, while light, floppier waffles can be made by simply setting a timer and removing your batter when it beeps. Waffles don’t tend to stick to the plates in this waffle maker, especially if the batter is made properly and the plates have been seasoned. It’s a good idea to brush the Texas-shaped grid with a bit of oil or butter before you cook (or use a cooking spray), but this is the only precaution you’ll need to take. As long as you perform this step, you’ll be able to easily lift your waffles out of the waffle maker. Longevity is an important concern with many kitchen gadgets. There’s a concerning trend among companies to make products that only last for a few years before they need to be replaced. This is not one of them. You can find plenty of reports from consumers who have used this state shaped waffle maker for years, often more than a decade, with nothing but good experiences. The reason for this probably has more to do with the lack of moving parts and the robust metal plates than it does anything else. Still, it’s nice to know that you can expect this waffle maker to stick around for a while. As far as cost goes, I found that this waffle maker was about the same price as comparable models that make normal shaped waffles. In other words, you’re not paying a particularly high premium for the oddly shaped plates. This surprised me quite a bit. It’s possible that online prices will change in between when I write this and when you read this, so be sure to do your research before you buy this waffle maker. But what about the shape itself? First of all, it doesn’t taste any different. Waffles taste the same no matter what shape they’re in. They’ve got a pretty similar texture, too, although the ratio of outer-crust to inner squares is slightly modified by the unusual curves that make up the Texas border. In other words, the waffles you make with this waffle maker are functionally identical to the waffles you make from another waffle iron except for the novelty factor. There is one small difference with how this waffle maker works, and that has to do with how it behaves when you overfill it. 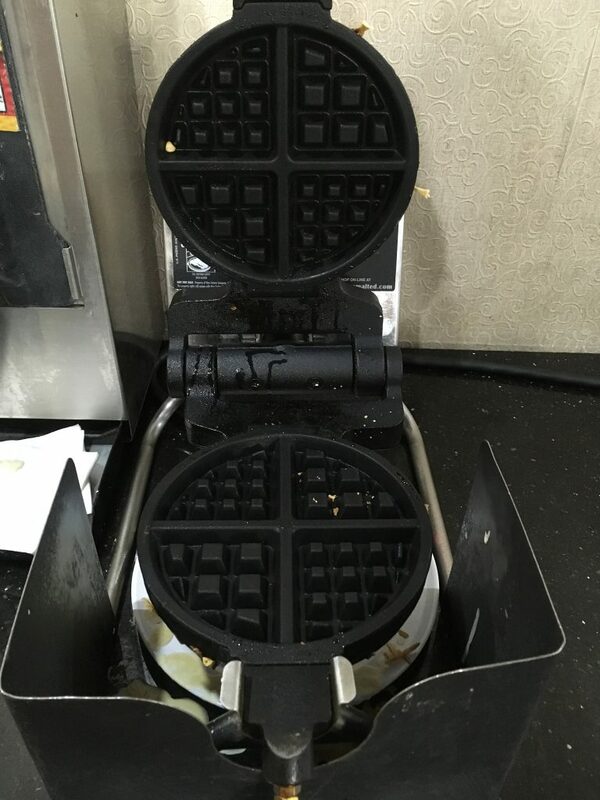 Because there’s a lot of room in between the border of Texas and the edge of your waffle iron, you’ll sometimes get some large flat parts if you use too much batter. This won’t ruin anything or cause any problems, but it’s a bit different from what happens if you overfill a “normal” circular waffle iron. Texas means different things to different people. For some, this waffle maker will be a great reminder of family, friends, or homes from the Lone star state. For others, the novelty shape might mean something completely different. 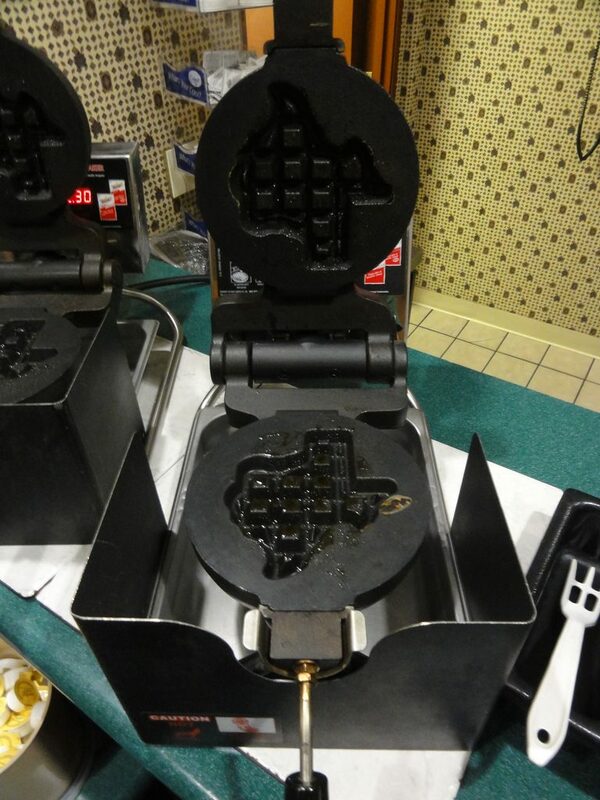 No matter what Texas means to you, this Texas shaped Belgian waffle maker is a solid addition to any kitchen. It’s about the same price as a good waffle maker from any brand and it makes pretty darn good waffles. The robust, durable design ensures that you’ll be enjoying your novelty waffles for years to come. It’s tough to find a rotating Texas waffle maker, unfortunately. If you’re after slightly more evenly shaped waffles and you don’t mind losing the distinctive Texas shape, this Hamilton Beach waffle maker is a brilliant device. The rotating plates help ensure that gravity works with you, not against you, meaning your waffles will be evenly cooked on both top and bottom. It’s priced comparably to the Texas waffle maker above, meaning you don’t have to pay extra for the helpful features included in this waffle maker. There are two big differences between this rotating waffle maker and the Texas-shaped machine above. First, this makes round waffles. Second, and perhaps more importantly, this waffle maker is loaded with extra stuff that helps improve the quality of your waffles. It’s got an adjustable browning knob, a stay-cool handle, and a rotating body that helps ensure that your waffle cooks evenly on both sides. The Texas waffle maker has none of these features. More importantly, however, the Texas waffle maker is a bit of a bear to clean. You shouldn’t immerse the waffle maker in water, so you’re limited to using a damp sponge to try to wipe out any messes that you happen to make. This Hamilton Beach, by contrast, features removable plates that you can simply throw in the dishwasher. 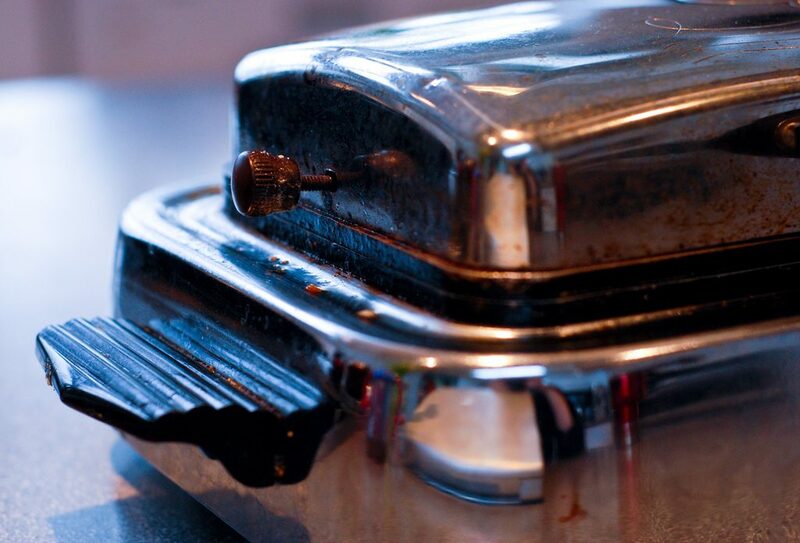 It also comes with a removable tray that sits below the cooker itself and catches any drips that occur. Now, there’s certainly something to be said for simplicity. A waffle maker does not need to be a complicated piece of electronics. Some people (including myself), would argue that you’re better off with a simpler machine. Sure, your waffles might not be as even, and you’ll have to control how browned they get with your timer, but you’ll get a more robust machine that doesn’t have any fancy moving parts that might break. If you’re a follower of that school of thought, consider choosing the state-shaped waffle maker above instead of this rotating Hamilton Beach. If you’d like easier, smoother waffles, however, this well-engineered tool takes the cake. Between the rotating cooker, the adjustable browning controls, and the slew of easy cleanup features, you’ll make amazing waffles with very little effort. I think this is definitely the product for anyone who prefers easy, round waffles to slightly more labor-intensive Texas shaped ones. Star Wars isn’t a state, but you can still make waffles that are shaped like it. This medium sized waffle maker offers a few fancy features while imprinting bold Star Wars iconography on the top of your breakfast. A browning control helps control how toasted your Death Star is, while a simple locking mechanism prevents the cooker from accidentally opening before you’re ready. Novelty waffles are a great way to get kids a bit more enthusiastic about breakfast (and getting up in the morning). This Star Wars waffle maker sets itself apart from a slew of similar models by featuring multiple types of pictures on four separate waffle quadrants. Importantly, you can simply flip the waffles over should you want deep grids for stashing butter, syrup, jam, or other toppings. This ensures that your kids (or your adult guests) don’t have to choose between having Star Wars waffles or having delicious waffles loaded with goodies. They can have both. While this model isn’t quite as basic as the Texas waffle maker, it’s still a simple machine that should hold up for years. The standard non-stick plates aren’t detachable for cleaning, but you’ll still be able to get by with a damp sponge. Star Wars was pretty popular when I was growing up, and it’ll probably be a big hit with the kids for many years to come. This makes this novelty waffle maker a great choice if you think you’ll be entertaining children at any point in the next decade or so. The deciding factor between this waffle maker and the Texas waffle maker above will probably be the tone. The Texas waffle maker often reminds people of family and community, while this waffle maker tends to get your kids enthusiastic about breakfast and satisfy your inner nerd. Think about what the state of Texas and Star Wars mean to you and your family and choose the one that resonates best with you. If neither is particularly evocative, there’s nothing wrong with picking up the easy, convenient Hamilton Beach. This Star Wars waffle maker is perfect for fans of George Lucas’ space franchise or people who just want to get their kids to enjoy breakfast more. It’s a fairly priced novelty tool that makes pretty good waffles that you’ll definitely enjoy eating. Texas means different things to different people. For some of us, it’s a reminder of friends, family, and community. For others, it’s a symbol of a certain bold, independent way of life. 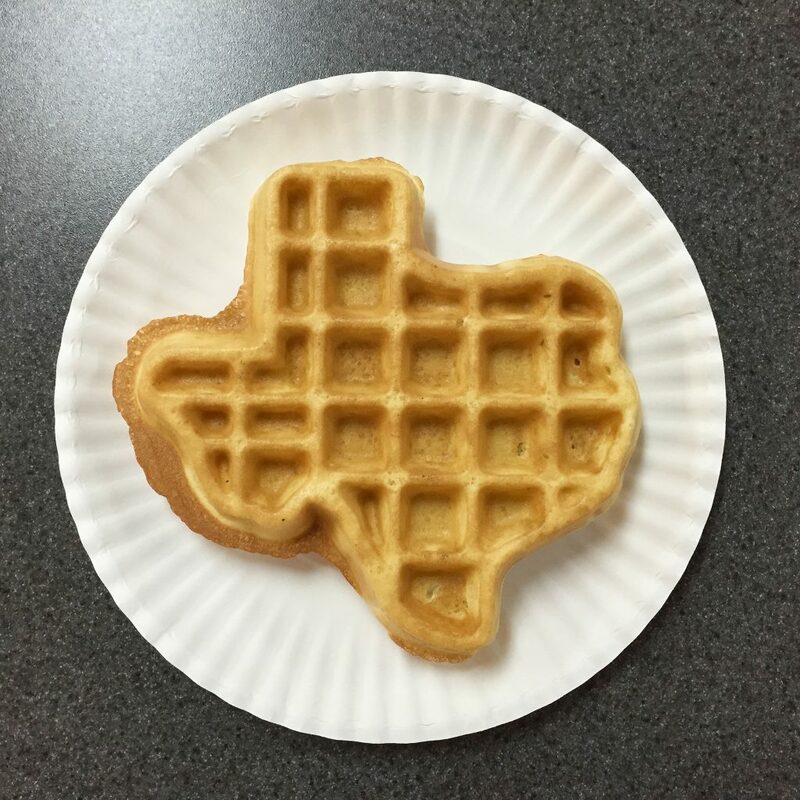 If you’d like to celebrate these ideas while enjoying a darn good waffle, the Texas shaped waffle maker is a great tool for you. You’ll be able to make breakfasts that remind you of all of the best parts of Texas while remaining delicious. Best of all, these waffle makers are pretty reasonably priced.